I will openly admit I dont know too much about wine, I am starting to understand alot more but I am still a long way off just yet. 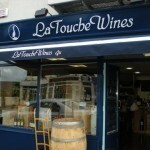 I have however found a new off license I blooming love, its La Touche Wines in Greystones : http://g.co/maps/gupwk. 2010 Pouilly - Fume - Cuvee De Boisfleury, I love this, it was wonderfully fruity and crisp and so easy to drink with white meats. 2010 Saint Clair - Sauvignon Blanc , again I found this bright and crisp and also continued on the story of the previous Pouilly Fume, it was beautiful. Both came on recommendation from Damian at La Touche, pop in and say hello and pick this man's brain he truly knows his wine inside out and I cant wait to return.